The Donmar Warehouse has long been my favorite theatre in London, and one of the most consistently excellent production companies in existence. 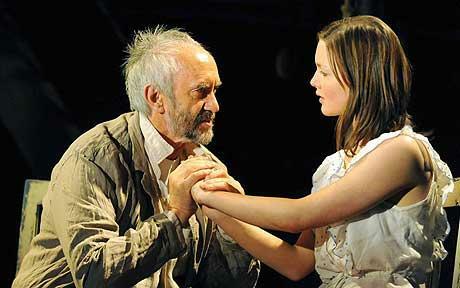 However, whilst 2008 ended excellently for them, with Ivanov and Twelfth Night at the Wyndham achieving high levels of excellence, it has seemingly come at the expense of the plays being put on at their own Donmar Warehouse which have taken a back seat with a few more mediocre productions like the fairly poor 'The Reunion' which reminded us that T.S. Eliot is best when he's writing poems. However, hopes were high with Michael Grandage returning to helm this production of Fugard's Dimetos. Dimetos is a skilled engineer who has retired from his highly esteemed position as a leader in his field and opted for rural exile in the company of his nubile niece Lydia and loyal servant, Sophia. And when Danilo, an emissary from an unnamed city, comes to plead urgently for Dimetos's return, he is given short shrift. Only Lydia's intervention gives Dimetos pause, leading to the disclosure of his more-than-avuncular passion. This play ends up being split into two acts with a distinctly different flavor. On the surface, the first half of the play places the focus on Lydia's coming of age, maturing into a fully developed woman out of very sheltered and innocent surroundings which leads to no end of confusion and difficulty for the young lady. Meanwhile we are filled in with the backstory of expert engineer Dimetos who has quit his line of work at the top of his game at the expense of all the people he would have helped. The second half then focuses on the inner anguish of Pryce's Dimetos and his descent into madness. The problem with this play is that it ends up being extremely overblown and wordy. It's one of those plays that clearly means a lot more to the author than it does to any of the audience members. The characters are soulless and empty and basically just serve as symbols for whatever moral the author is trying to convey, which is not entirely clear. Indeed many of the words begin to lose meaning towards the end as well.